Everyone has some sort of psychic ability which they call intuition or gut feelings. Psychic awareness differs from person to person. Reiki can allow you to enhance your psychic awareness and removes blockages. It does not mean all Reiki practitioners have great psychic abilities. When the time is right in your spiritual journey, your psychic awareness will improve. There are three main types of psychic awareness: Clairaudience, Clairsentience and Clairvoyance. After Reiki attunement, some people start hearing messages from their Guides and Angels very clearly. Some becomes ‘medium’ who hears messages from discarnate ones (who are no more alive). Some communicates with their departed loved ones. Some evolve to higher extensions and can hear Ascended Masters. This ‘hearing’ may be like actual hearing or the words appears in form of thoughts. Example- when you ask yourself a question, you get the answer even before you finish the thought. Another example is, when your thoughts converse with ‘YOU’ and not ‘I’. When you are self-talking, generally ‘I’ is used. When your guides or higher-self conversing, you will hear ‘YOU’. After Reiki attunement, some develops awareness of sensing subtle energies. This ability increases as their experience with Reiki increases. 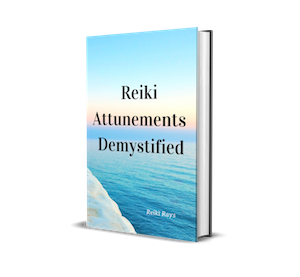 The people who are clairsentience can detect different layers of aura and blockages which take their Reiki experience to another dimension. Some also develop the ability to sense the presence of their departed loved ones, spirits, entities, angels and guides. After Reiki attunement, some develops the ability of ‘clear sight’. They can see auras, detect blockages in chakras and see impurities in energy field. This ability improves and develops more with Reiki experience as Reiki opens and balances the third eye. Some are so extremely clairvoyant that they can get flashes of past and future. Some can also see their angels and guides or discarnate ones. I am not saying you can definitely develop this psychic awareness once you are attuned to Reiki. As the time elapses, you will definitely see the changes in your psychic awareness, depending how much you practice Reiki. The more you bring Reiki to your life, the more increased chances of developing above psychic abilities. Easiest Reiki method to develop and increase your psychic awareness and intuitive power is to use Reiki symbols on your third eye/brow chakra. Your brow chakra/third eye is the base of insights, inspirations and intuitions. Draw CKR and SHK on both palms. Those who are attuned to DKM can draw DKM too. Draw these symbols on the third eye aura as well as on the third eye. Hold one palm on your forehead and other at exact level on back of the head. Intend that Reiki flows through third eye to increase your psychic ability for your highest good. Give Reiki for few minutes. Do not practice this for long as you may develop headache. Those who have set crystal grids or Reiki box, can put the intention slip in the grid/Reiki box – Draw symbols on paper and write “I wish to develop and enhance my psychic awareness for my highest good”. Meditating on master symbol DKM also increases psychic awareness. Robin, thank you for this extended list. Very helpful! May I ask to receive your mailings please! A great and thought provoking article. Thank you. Rinku, Thanks for sharing this wonderful teaching. Thanks Rinku ji for sharing your wisdom pearls so unconditionally with every one ! I am very interested about opening the third eye and other abilities can you email me this information please? OK, good thing : you aware people about the headhache but you say nothing about what to do if it hapens. So… I’m asking you the question : What do we do with the headhache caused by growing psychic habilities are developped. I’m a Reiki practitionner for around 22 years now and a master for few months. For a year, I have a lot headhaches. Since I’m a master, the headache are increased. My master told me it’s because there is to many energy in my head. So, I flush the energy by my foots and I blow it. But it does not work all the time. It also take a long time to work (around 30-60 minutes). Do you have some other suggestions or idea about this? I am a Reiki theripist and shaman. I love being able to work from both sides of the hedege row for clients. The strongest hits (a hit is energy and information coming to you that you know that isn’t your energy) I have gotten were when life had extremely rattled my cage enough to drive me to meditate and or journey for answers and perhaps solace. Rafial stated his name very clearly after one of these shaman sessions. Michael sent strong images one day when I needed comforting and solace. Ask your guides and and arch aingles for blessings. They help a lot. Brigid gives one of the longest and most intense blessing, the lotus flower is a beautiful blessing, and Jesus gives a very intense brotherly love energy.